Scientists in Pennsylvania believe they have found a mass grave containing the bodies of 57 Irish immigrants who died 175 years ago. 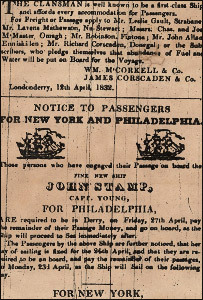 The men from Donegal, Tyrone and Londonderry had made the journey across the Atlantic in the summer of 1832 to work on the railroads, but their time in the US was tragically short. Mystery still surrounds the question of how they met their deaths just six weeks after getting off the boat - a cholera epidemic was blamed, but foul play has never been ruled out. At the time, a cholera epidemic was spreading towards the area known as Duffy's Cut, and one theory is that some of the men - none older than 25 - were murdered by local vigilantes afraid of them spreading the disease. One factor suggesting that some of the men were murdered is that death from cholera was not inevitable, as the disease's mortality rate was not more than 65%. With much prejudice in Pennsylvania against the Irish and Catholics at the time, the men may have been seen as an expendable underclass. 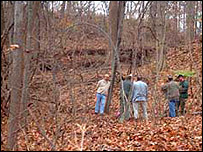 The apparent cover up by the railroad company which followed their deaths means the location of their graves has been a mystery until now. Researchers have spent three years sifting through dirt, and have uncovered some of the workers' possessions such as clay pipes and shirt buttons. They now believe a breakthrough has been made, having turned to modern technology to solve this old problem. Immaculata University history professor Dr William Watson said advances in thermal imaging had helped them find where the men were buried. Bullet holes in the men's skulls would confirm they were murdered. However, the archaeologists will also turn detective, looking for clues such as if they were in a coma and presumed dead but actually buried alive.